Beantown Camp has been working since 2012 with the Frankie Manning Foundation’s Ambassador Program. This year we are thrilled that the FMF may be sending five new Ambassadors to camp, as they have been pleased with the opportunity available for the recipients. Expenses for all new Ambassadors are covered by the FMF. There have been 18 Ambassadors who have attended Beantown through the FMF program, and for some it has been a life-changing experience. 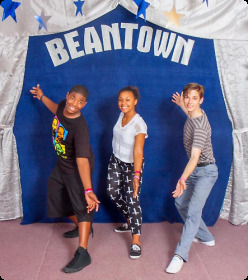 The Beantown Ambassador program began as a means to help past scholarship recipients return to camp in subsequent years. There are no fees for camp registration, however, funds are needed to cover expenses such as housing, meals and travel. We’re excited to see the time at Beantown having an impact! It’s an excellent opportunity for Ambassadors to take classes, meet dancers from around the world, spend time with Norma Miller, and immerse themselves in Lindy Hop. In addition, it’s a chance to work with other Ambassadors, whether on a performance, on their dance skills, as well as how to go forward with the role of Ambassador to pass on Frankie’s legacy. The more experienced Ambassadors are now mentors to the newer ones. Success would not be possible without the help from Beantown campers and other members of the dance community. As the number of Beantown Ambassadors increase, more funds are needed as expenses also grow. Funds are raised through donations and all profits from our local Uptown Swing fundraising dance each spring. Any help is much appreciated!